This is the Best-Selling Mirabelle F-Style Bra/Exercise Bra/Yoga Bra on the market. Crafted from soft stretch fabric. Scoop neckline, classic and popular. Cross over back, unique and chic. It has been cut with a body fit. 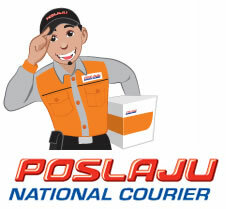 We will use the Pos Laju courier for delivering your item to your doorstep. 1.The item you bought will be shipped out in 1 - 2 working days after your payment is confirmed. 2. Estimated Arrival: ~ 1 - 3 working days (Peninsular Malaysia) and 2 - 4 working days (Sabah dan Sarawak) after receiving tracking number. 3.Tracking number will be provided after item has been shipped out. 4. Please make sure you provide the correct shipping address and contact details, as we will not responsible for any wrong delivery address.